The Central Hotel in Prague is a good 3* hotel, located in a quiet area of the Old Town, just 3 minutes walk from the Old Town Square. The entire seven floor hotel building has undergone extensive renovation; the result of which is a classic city centre, modern hotel, within easy walking distance of Prague's main historical sights & attractions. 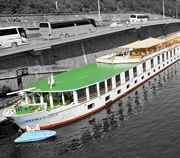 The Florentina Boat Hotel is a large refurbished river cruiser moored in the city centre of Prague. From the riverside cabins and public decks there are fine views across the river to the Old Town, and also of the city's riverside attractions. Enjoy a comfortable night's sleep in one of 49 modern cabins. 4* Hastal Hotel is situated on a quiet, charming little square dominated by a beautiful gothic church. 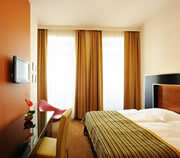 Hotel guests will not believe that in this tranquil setting they are just a few minutes walk from the Old Town Square. Hastal is a small to mid-sized hotel reconstructed from a historic building. It offers high-quality accommodation in comfortable, spotlessly clean rooms. 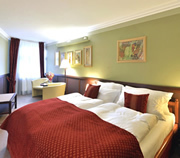 The 4* Antik Hotel in Prague is set on a quiet street in the heart of the Old Town. 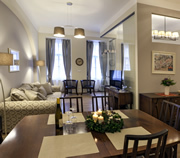 This ideal location is a mere 2 minutes walk from the Old Town Square. The Antik is a lovely, family run hotel that has recently benefitted from a major renovation project. 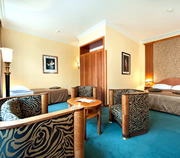 It offers 30 gracious, well equipped rooms, furnished to a high standard. 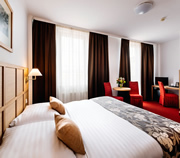 There is a style and elegance to the rooms which will appeal to tourist and business guests alike. The 4* Royal Esprit Hotel is set in a superb position in the heart of the Old Town, 2 minutes walk from the Old Town Square and 5 minutes from Wenceslas Square. Rooms at the Royal Esprit have been nicely refurbished with warm, welcoming colours, and are well furnished with stylish, quality Art Deco furniture. An ideal base from which to explore the city. 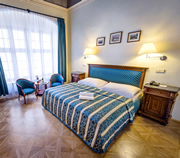 The 4* deluxe Grand Majestic Plaza Hotel is located just 5 minutes walk from the Old Town Square. This modern, design hotel is situated in a smart area of the Old Town, surrounded by newly reconstructed cafés and restaurants. It will appeal to leisure and business guests alike. Grand Majestic Plaza Hotel has 196 well designed rooms. 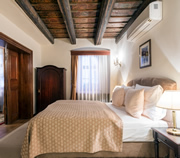 The 4* Aurus Hotel is a beautiful, small hotel in the heart of the Old Town, just one minute walk from both the Old Town Square and Charles Bridge. Situated in an excellent location on the Kings Road, Aurus is a magnificent building and a protected monument, dating back to the 16th century. 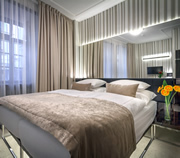 The 4* Clementin Hotel is set in a quiet street right in the heart of Prague's Old Town, just one minute walk from both the Old Town Square and Charles Bridge. Built as a town-house around 1360, the Clementin Hotel is one of Prague's best located hotels and forms an integral part of the city’s history.